I have spent my last weekend in Hungary, Hajduszoboszló at the local Aqua Palace Although the main purpose of this weekend was to relax I couldn't fight visiting a Rossmann store in search of some new nail polishes. I had been dreaming of this polish from the moment I've seen it here and now I finally got it :-D. I am talking about Lovely Color Mania - Nr. 166. This is a glitter polish containing light blue, light pink hexagonal glitters and silver dot glitters. I plan to use it on top of a dark blue polish. Another glitter polish, this time only with hexagonal glitters. It contains 3 colors: light green, blue and black. At first I didn't want to buy this one but my boyfriend liked it so much I couldn't leave it there. Now it's one of my favorites, I am so glad I have brought it! 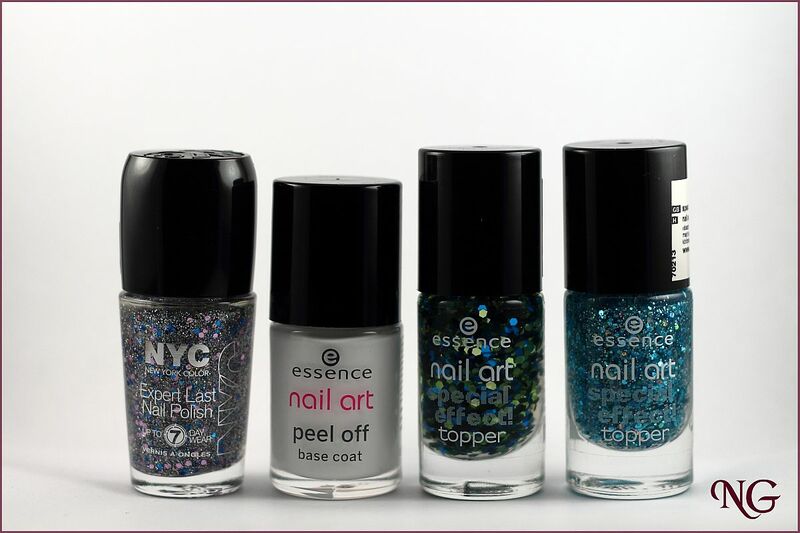 This polish is all about blue and turquoise glitters in different shapes and sizes. This product is just amazing! I love it! It's like...fallen from the glitter polish heaven :-D. It takes under a minute to remove the "worst" glitter I own: Milani Jewel FX in 3 coats! As I have said, this polish is a dream came true. On top of all, it had only cost me 246 Ft. That's about 4 RON or 1 EURO! Multumesc, ojele Essence chiar sunt frumoase. Ma bucur ca le-am gasit, in Cluj nu se gaseste aceasta gama.